“I’m allergic to brussell sprouts!” As kids, many of us probably tried using an excuse like that to get out of eating our vegetables. But today, if a kid tells you they’re allergic to something, it’s important to take them seriously. According to researchers, an estimated 5.9 million children under the age of 18 have a food allergy and 30 percent of those children have multiple food allergies. 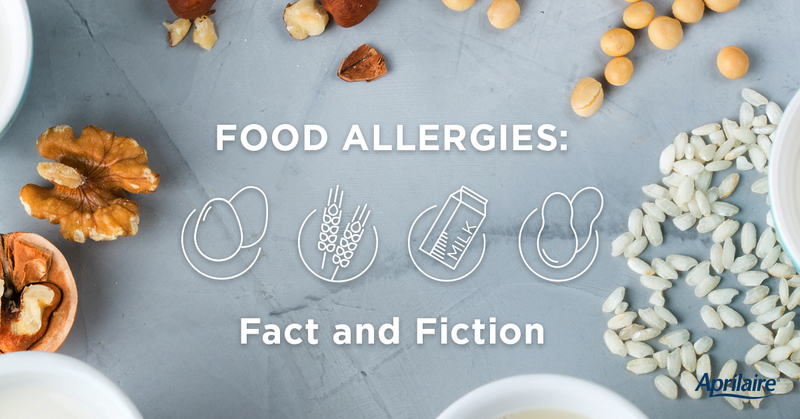 Even if you are not a part of the food allergy community, it is important to know what’s fact and what’s fiction when it comes to food allergies. Myth: All food allergies appear in childhood and last a lifetime. Fact: Food allergies can develop at any age even if you’ve eaten the food before with no reaction. Children are most likely to outgrow a food allergy over time. This is common with allergies to milk, egg, soy and wheat. Peanut, tree nuts, fish and shellfish allergies are harder to outgrow. Fact: Food allergies have the potential to be life-threatening and should always be taken seriously. It’s so important to read menus thoroughly, ask lots of questions about what’s in a dish, and be prepared to take action if an allergic reaction occurs. Myth: Eating a little bit of the food you’re allergic to is okay. Fact: The smallest trace of a food allergen can cause a severe reaction. Removing all sources of the allergen from one’s diet and surroundings is the only way to ensure safety. Myth: A mild reaction equals a mild allergy. Fact: Although there are mild to severe allergic reactions, there is no such thing as a mild food allergy. All food allergies are serious with the potential to cause anaphylaxis. Always error on the side of caution. So now that you know what’s fact and what’s fiction, it’s time to spread the word.